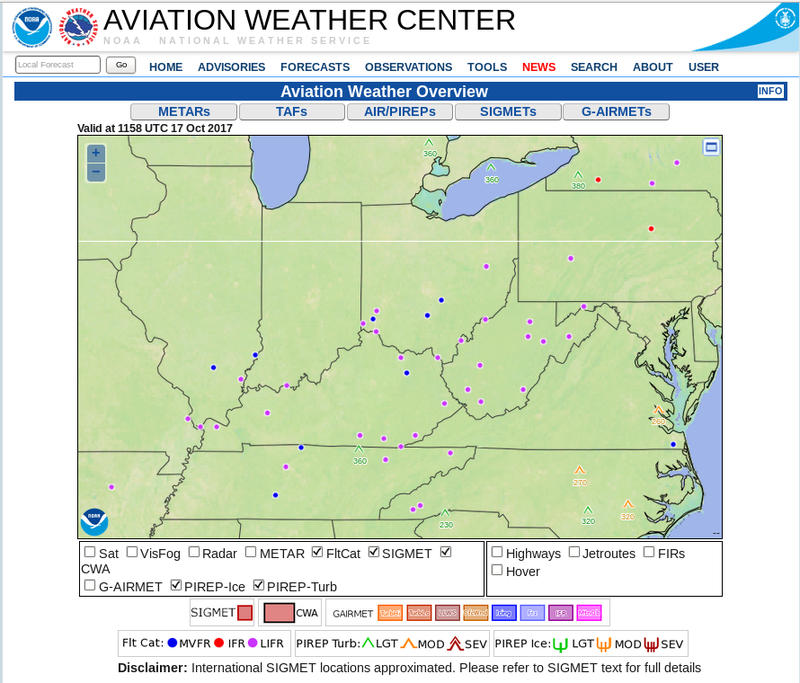 Clear skies and light winds allowed for the development of Radiation Fog over parts of West Virginia and surrounding states early on Tuesday 17 October 2017, and IFR conditions were widespread (Source). GOES-16 and GOES-13 both monitored this event, and toggles between the two brightness temperature difference fields, from 0315, 0415 and 0615 on 17 October, are shown below. 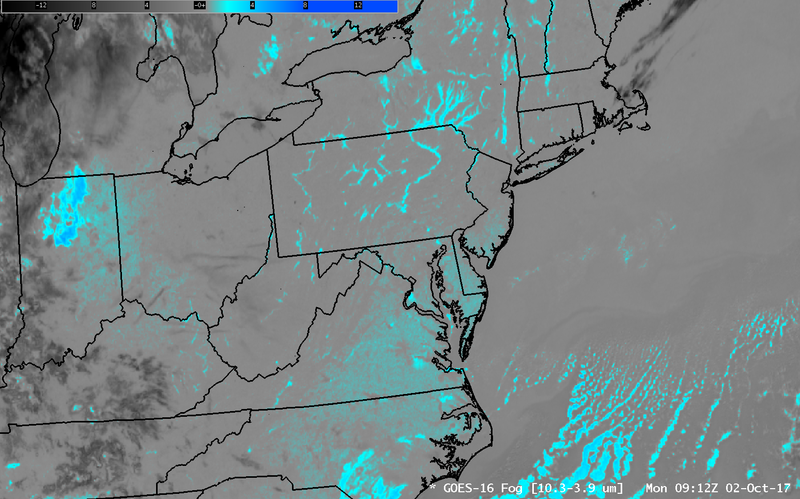 The better spatial resolution (and better precision) of the GOES-16 ABI is apparent in the imagery: At 0415 UTC, GOES-16 is detecting river fog in many valleys in West Virginia and Kentucky, and is better resolving the detected fog over the Allegheny River in northwest Pennsylvania. By 0615 UTC, the fog is also detected by GOES-13 — meaning it has increased in size so that the GOES-13 pixel size can detect it. GOES-16 had a lead time of about 1-2 hours on GOES-13 in this case! 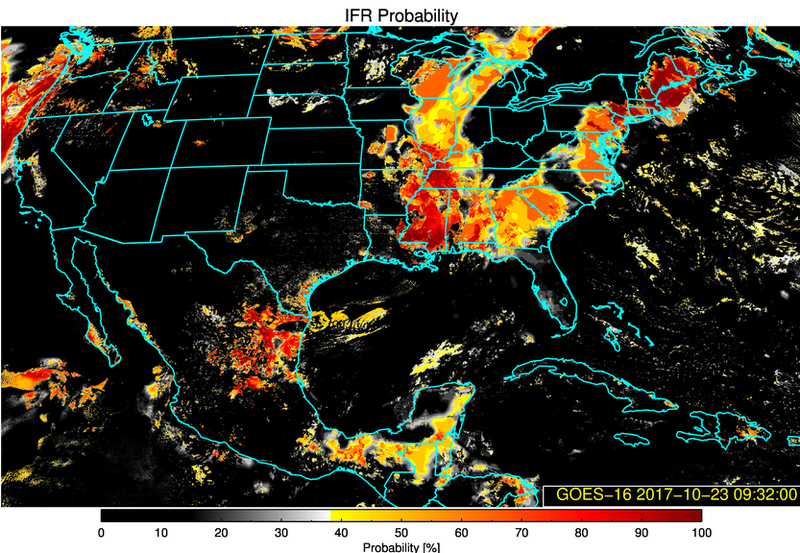 At present, GOES-R IFR Probabilities are created using GOES-13 data (or GOES-15 data for the western United States). As might be expected, the GOES-R IFR Probabilities also lagged the GOES-16 Brightness Temperature Difference field in alerting to fog. The short animation below shows values hourly from 0315-0615. 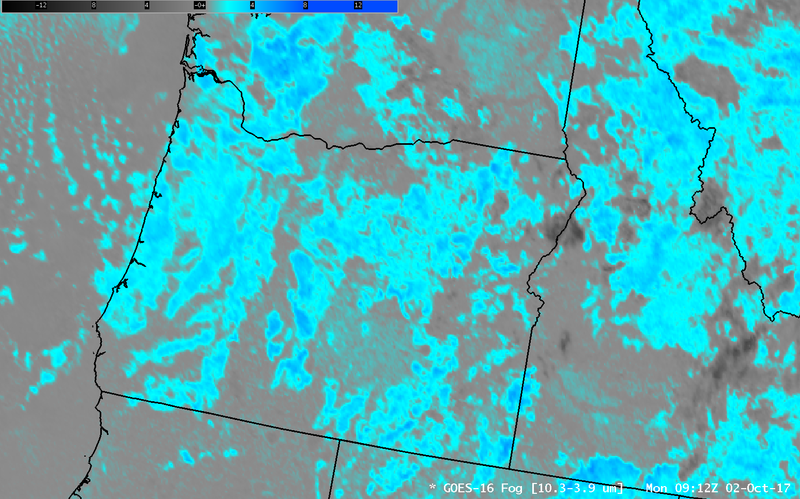 Very small IFR Probabilities are present at 0315 and 0415 — because, in part, the GOES-13 Imager cannot resolve the developing Fog/Stratus (and the Rapid Refresh model lacks the horizontal resolution to reproduce what is happening in narrow river valleys). By 0515, and 0615 especially, GOES-R IFR probabilities are suggesting that a region of fog is likely. One other thing to note: There is a small signal in the brightness temperature difference field at 0315 UTC, above, in northwest Ohio in both GOES-13 and GOES-16 imagery. There is no corresponding signal in the IFR Probability field. The conclusion is that this is mid-level stratus that is not affecting surface visibility or ceilings. 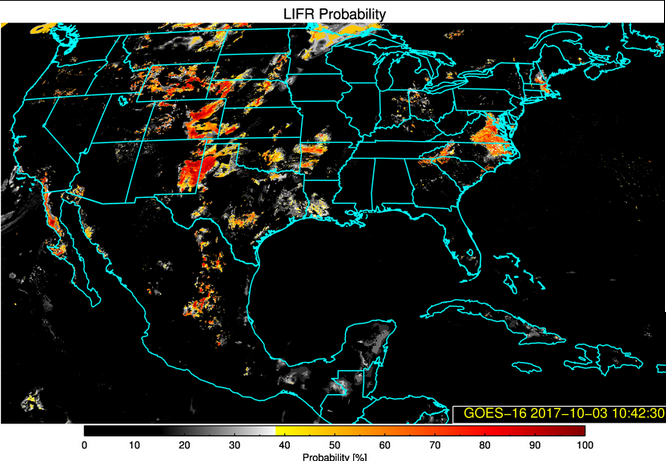 GOES-R IFR Probabilities, supplied via an LDM feed to National Weather Service Offices, will use GOES-13 (or GOES-15) imagery until GOES-16 is operational at 75.2 degrees West Longitude. When GOES-16 is operational, GOES-R IFR Probabilities will use GOES-16 data, and that data will flow through the LDM. 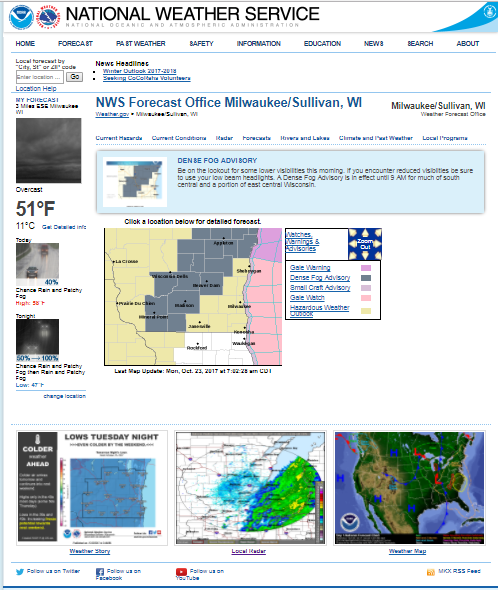 In the meantime, GOES-16 IFR Probabilities can be viewed at this site. Fog returned the following morning. Link. This entry was posted in Appalachia, GOES-16 on October 17, 2017 by Scott Lindstrom. 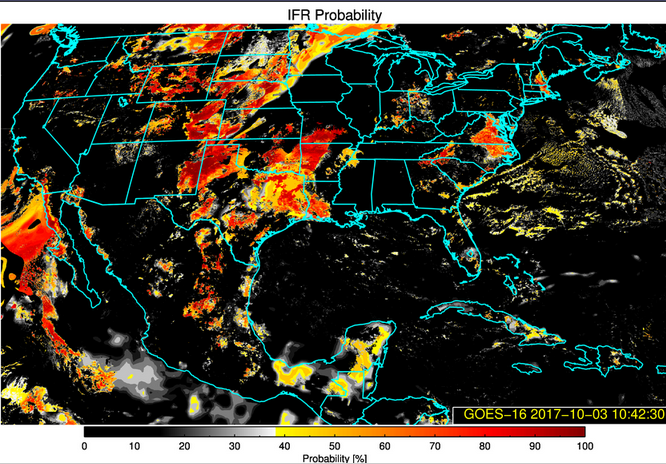 The suite of GOES-R IFR Probability products are now being computed using GOES-16 data, with a 5-minute temporal cadence over CONUS. Products include IFR Probability (above), Low IFR Probability, MVFR Probability and Cloud Height. These products are only available for now at http://cimss.ssec.wisc.edu/geocat ; however, work is progressing to have the fields available through an LDM feed. The GOES-R IFR Probability fields computed using Legacy GOES (GOES-13 and GOES-15) continue to flow to the National Weather Service via the LDM. This entry was posted in GOES-16 on October 3, 2017 by Scott Lindstrom.